Producing excellence in the name of Jesus! 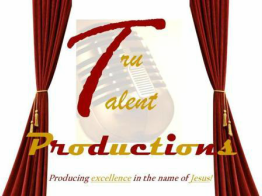 Tru Talent Productions is a multi-faceted company whose mission is to produce excellence in every service it provides in the name of Jesus! We offer professional services that bridge administration with creativity. Aiding our clients in bringing their visions to reality is our expertise. God has given us so many talents and it is Tru Talent Productions' duty to help make yours shine by gleaning from ours to bring you the best services possible! -SELECT us for consultation to produce excellent projects, programs or productions! -Book "Miss BJB", our Spoken Word Motivational Speaker, for your retreat, conference, workshop, school or event. - Hire us to bring your vision to fruition - let us help you get your life. - Engage in various media outlets that enlighten, entertain and educate. - Join our community of women that is designed to CULTIVATE, support and encourage THE PROVERBS 31 WOMAN. - CURRENTLY, WE ARE NOT IN SERVICE. SORRY FOR THE INCONVENIENCE.